The first name on the team sheet for Chinese Taipei for over 15 years, the name of Chuang Chih-Yuan once again appears prominently on the international stage; he is the no.2 seed in the men’s singles event at the forthcoming Seamaster 2019 ITTF Challenge Plus, Oman Open. Play starts in Muscat with the qualification tournament on Wednesday 20th March; the main draw commencing Friday 22nd March. Now 38 years old; in the men’s singles event, Chuang Chih-Yuan lines up alongside colleagues at least two generations his junior; Lin Yun-Ju, 17 years old is the no.3 seed, Liao Cheng-Ting, 23 years of age is the no.18 seed. The further member of the group is Peng Wang-Wei, 22 years old, he must compete in the qualification tournament. Irrepressible, win or lose, Chuang Chih-Yuan is soon ready for the next challenge; that fact was made clear when he was of a similar age of his colleagues in Muscat. In 2002, at the time 21 years old, he reached three ITTF World Tour men’s singles finals; he lost all three. In Doha he was beaten by Belgium’s Jean-Michel Saive, in Eindhoven by a promising young man from China named Wang Hao, before in Japan suffering at the hands of Kalinikos Kreanga of Greece. 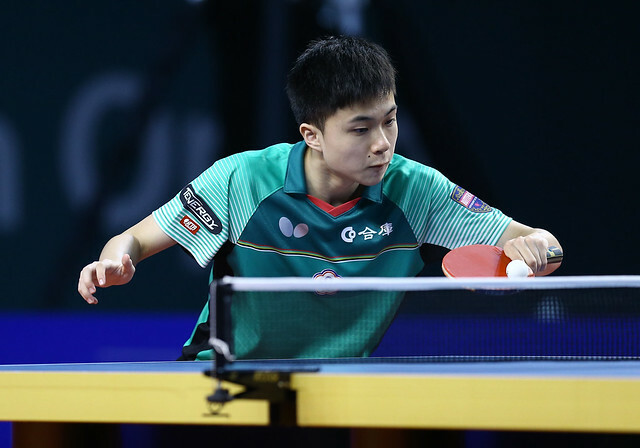 Disappointments but as the year came to a close, on Sunday 15th December, in Stockholm, he won the men’s singles title at the ITTF World Tour Grand Finals; the only player ever to achieve the feat of winning at the Grand Finals before winning on the Tour. Notably, he beat China’s Kong Linghui, the reigning Olympic champion, before extracting revenge; he overcame Jean-Michel Saive, Wang Hao and Kalinikos Kreanga to arrest the title. Now there is a lesson for his younger compatriots, learn from defeat and return stronger. Furthermore, Chuang Chih-Yuan set the trend for those who accompany him in Muscat. Prior to his appearance, the leading male names from Chinese Taipei were Chiang Peng-Lung and Chang Yen-Shu, both pen-holders using just one side of the racket, forehands to make an opponent take evasive action. Times have changed, male or female, now the prominent Chinese Taipei names are all shake-hands grip exponents; Chuang Chih-Yuan was at the vanguard of that change, he set the example. It is the same in Muscat, he sets the example, the example for his younger brethren to emulate.